As directed by Jonathan Glazer, 1996’s music video for the Jamiroquai song “Virtual Insanity” was a pretty big hit as lead singer Jay seemingly glided around the floor of an ever-shifting room. And while it was a catchy tune and a cool visual, wouldn’t it be more fun to be the tiny Britpop star evading various pieces of furniture? That‘s the idea behind Buncho Games’ newest release, Jamiroquai Game. 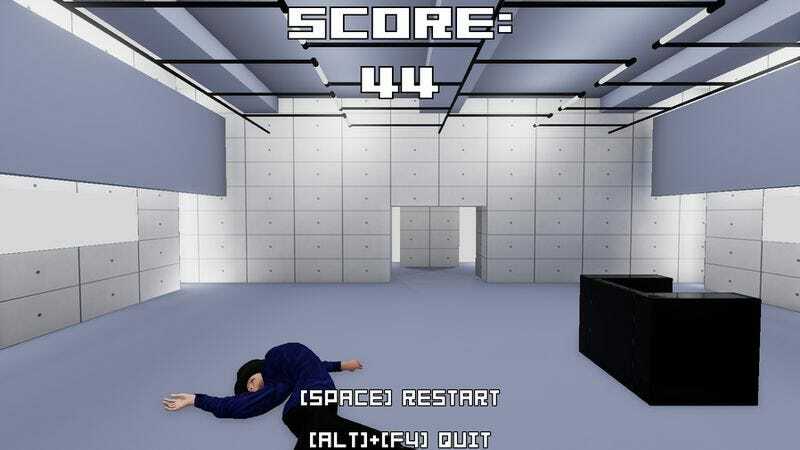 In the game, which is currently only for Windows machines, users control tiny Jay (or, for legal purposes, “Man In Funky Hat”) as he tries to avoid being hit by the chairs and sofas gliding around on the floor. When Man In Funky Hat gets hit, the game ends and players get their score based on how long they lasted. It’s a clever idea that’s a nice throwback to ’90s music that also features a satisfying “thwack!” every time Man In Funky Hat fails to avoid a chair. The game can be found on Game Jolt for download and play. A video of the gameplay both to see what is involved and to get those opening notes stuck in your head for the rest of the day.